LIMITED TIME OFFER ONLY – ACT NOW. Simplicity and style all rolled into one. 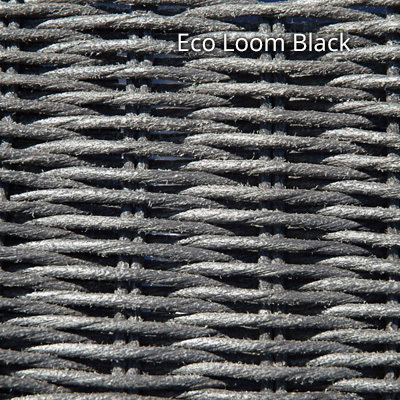 Available in two colours – Charcoal and White – the ECOLOOM weave is wrapped round the reinforced aluminium frame until it’s just off the floor. This is a great attention to detail that gives the whole suite more majesty. Designed for the outdoors, it can be used to just as good effect indoors as well. The legs are capped with plastic caps to keep its integrity throughout. 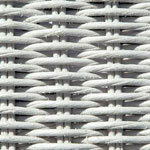 What’s so good about Ecoloom Rattan Furniture? 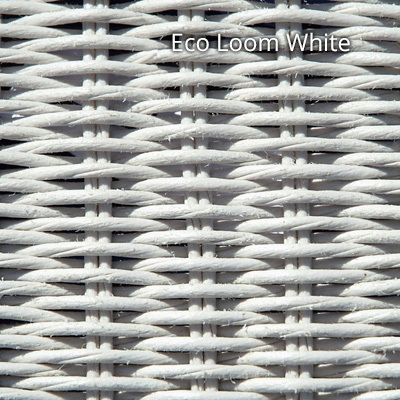 Manufactured by Ecolene and based on the original, ‘paper-loom rattan-weave’ first made famous by Lloyd Loom in the early 1900’s, Ecoloom is a patented synthetic fibre. However, whereas the original ‘paper loom’ could only be used indoors Ecoloom, being synthetic, is perfect for outdoor use as well. Why is Ecoloom so good for outdoor use? It tolerates a huge range of temperatures without losing its quality finish. As an eco-friendly material it contains no harmful Cadmium, Lead or Chromium which is still present in other rattan furniture on the market today. The softly textured finish mirrors the original paper loom very convincingly. It has a high resistance to water of all types including chlorinated water making it the number one choice for use with swimming pools. It’s a cinch to clean in about five minutes flat. It comes with a full guarantee for three years from date of purchase. The colours on an Ecoloom rattan-weave are considered to be more vibrant than its ‘paper loom’ equivalent. If you require more information do not hesitate to contact a member of our Sales Team.